In conventional PET imaging a positron annihilation is recognized along a 180 degree line of response, not at the actual location of the event. A PET scanner calculates the location of the positron annihilation by measuring the angles based on a point in a 180 degree angle of incidence. In other words: by calculating the intersecting 180 degree lines, the computer can tell where the actual origin point of the positron annihilation is. All of the photons released during the course of a PET scan strike the detectors at almost the same time; almost being the key word. They are usually differentiated by measuring the attenuation, or fall-off, of their signal. This attenuation occurs naturally as the positron works its way through body mass. The highest attenuation happens at the thickest parts of the anatomy. Using a lot of computers and software to analyze the attenuation (or fall-off), radiologists and oncologists are able to get a very good idea of where the positron annihilation event and, therefore, the targeted mass or anatomical region is. We said above that "almost" is the key word when describing time of contact between PET detectors and the bombardment of positrons they receive. Time of flight (TOF) technology takes measurement a step further. Using measurements of pico-seconds, TOF measures not only the distance and attenuation of photons, but adds to the algorithm the actual time difference between the detection of photons released during coincident events to more accurately identify the distance from the annihilation event to the detector. Simply put: time of flight offers higher image quality for more accurate detection of masses and lesions- especially in large patients. A more accurate system gives you better information, and better information makes it easier to declare a more definitive diagnosis and pursue a more specialized treatment plan. While many PET scanners that don't have TOF can still create quality images that show radiologists what they need to see, systems with TOF offer a diagnostic advantage. The "big three" manufacturers (GE, Siemens, Philips) all offer TOF now. Philips was first, on their Gemini TF scanners in 2006. Siemens began offering TOF as an option in 2010, and GE followed a couple of years later on their PET/MR. Because the Siemens and GE offerings are so recent, if you are looking for TOF on the secondary market, you will find mostly Philips TF systems at this time. 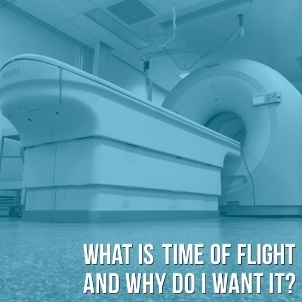 Time of Flight is one of those technologies that can take an entire imaging modality a step forward. 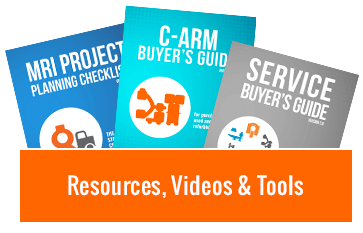 Like other technologies before it, there will probably come a day when TOF is a standard feature on PET equipment, but in the interim, if you're wanting to upgrade your capabilities, you'll need to seek the feature out. If you're ready to start the conversation, our team is ready to help. Use the button below to tell us about what you're looking for and receive an equipment quote.